The islands of the Outer Hebrides of Scotland comprise the Uists, Harris and Lewis. The isolated, rocky islands are fringed with beautiful sandy beaches that are often compared to those of the Caribbean, in appearance, but not climate! They are also famous for the unusual coastal features known as “machair” that occur there. Machair (a Gallic word for a flat plain) is a flat sandy plain made up of wind-blown sand that is covered in grasses and is therefore a favoured site for grazing by local communal farmers known as crofters. It only occurs in western Scotland and Ireland where winds are very strong and persistent. 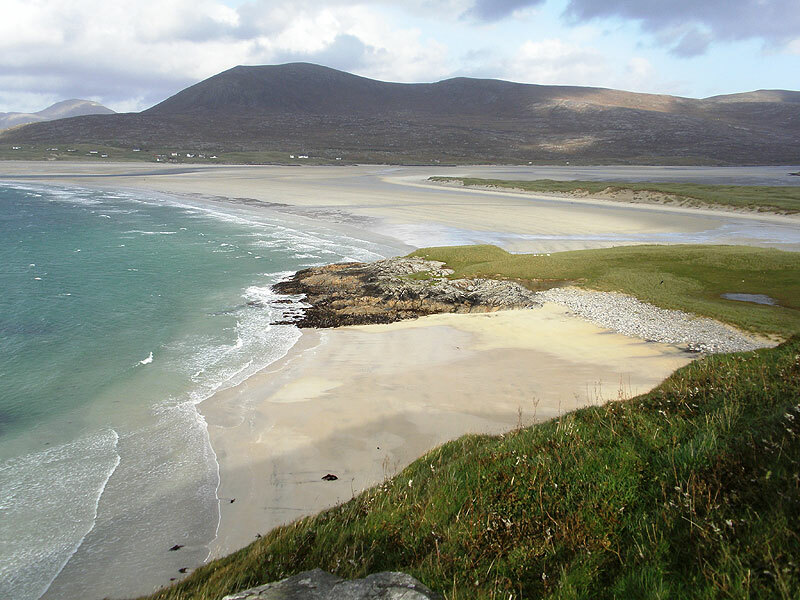 The machair along the Uists is highest at the back of the beaches from which their sand is blown. Sometimes there is even a dune ride on the seaward edge of the machair, but the machair slopes landward and large areas are below present high tide level. They therefore need the protection of the dune which acts like a natural dyke. Both the beaches and dune/machair are made of predominantly of carbonate sand (the shells of dead marine creatures). The coastline has been retreating along most of this coast from many years due to rising sea level and a sediment deficit. There has been a long history of removal of beach sand for agricultural purposes. A severe storm in 2005 caused widespread damage and loss of life along the island chain. It also caused substantial coastal erosion, particularly of the coastal dune and machair. At many locations, the erosion of the dune has left the machair behind it at risk of flooding from future high tides and there is much concern about the potential loss of farmland behind the dune. The erosion has also revealed some important archaeological sites- Iron Age ‘wheel houses’ (so called because they resemble a wheel in plan) have been exposed at the coast by the erosion. They are being carefully recorded by local archaeologists as successive high tides cause more erosion and reveal more parts of the structures. 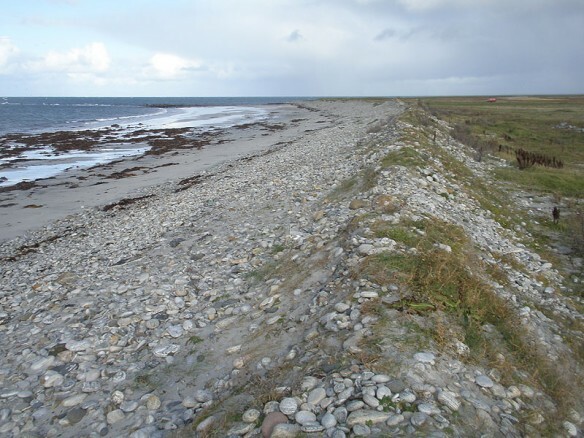 Concern among the crofters (communal farmers) about potential flooding of low-lying areas behind the frontal dune has led to calls for coastal defences to be constructed and low-cost works involving tyres are being considered, despite the environmental damage they are likely to cause. The photos show the spectacular beach at Seilibost, and traditional farming on the machair (the flat plain of wind-blown sand, which is the main area of arable land). Erosion of the seaward edge of the dunes, and machair, exposed archaeological sites and peat exposed on the foreshore, are all indications of shoreline retreat, which is promoted by low sediment supply and sea level rise.